Boys hockey tryouts will be the weekend of Sept. 14th. If you are interested, sign up at the main office on the counter. There will be a $20.00 fee for those trying out. Girls hockey tryouts begin on September 6. For all the dates and times and to sign-up, please come to the main office. The cost is $20. Sept. 3 Mr. Zilkans Pd. 2 rec class is at Sandy Beach for baseball today. If you need a ride, please go to the back doors by the small gym. The Torch of Life Relay is in Dryden today as part of their tour to promote organ donation awareness. We will live webcast the student assembly starting at 9:30 am. The Dryden Eagles Nordic Ski Team was in Huntsville last week for the OFSAA Nordic Skiing Championship which were on Wedndesday February 22 – Friday February 24th. Luke Smith, Ilya Perkins, and Brayden Davis qualified for OFSAA at NWOSSA, which was held in Marathon a few weeks ago. The event was held in two locations – Arrowhead Provincial Park (10 minutes north of Huntsville) and Downtown Huntsville. Wednesday February 22nd – Pre ski day – was at Arrowhead Provincial Park and was used to pre ski the course in order to get to know it (hills, flats, pacing, etc), to get the blood moving after a long travel day, and to test waxes for the next two days. 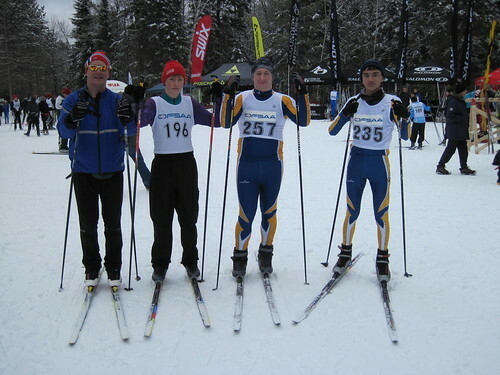 On Thursday February 23, the individual races were held just north of Huntsville at Arrowhead Provincial Park. They have a great Nordic Trail system. The weather at race time was 1 degree Celsius.The junior boy’s race was 6 km long, and was very competitive with 177 junior boys registered to race. Luke Smith did very well. He placed 85th with a time of 20:46.9 minutes. (20 minutes, 46.9 seconds). Ilya Perkins was right behind him coming in 132nd and a time of 22:55.7 minutes. It was the first OFSAA for these three skiers. The OFSAA banquet was held on the evening of Thursday February 23rd. The Keynote speaker was Dan Roycroft, a former Huntsville High Student who competed at OFSAA and who went on to ski in the FIS Nordic World Ski Championships and he competed in the 2006 Winter Olympics in Turino Italy. In addition Roycroft created and runs Zone4 Systems which is an online registration system and race timing software company. He had a great message of perseverance and goal setting for all of the athletes and coaches at the banquet. On Friday February 23, the team relay races were held on the main streets of Huntsville. From about 4 p.m. on Thursday until about 7:30 a.m. on Friday, event organizers and volunteers including a number of local contractors hauled over 150 dumptrucks of snow that they had been accumulating during the winter into the downtown streets of Huntsville. Grooming crews worked all night to get the snow conditions just right for the team relay races. The snow was packed to a depth of 8-10 inches. These downtown races are done a lot in Scandinavian countries and it is a great way to get more people to watch the races. The downtown business people of Huntsville were very supportive. Our boys competed well in the relay and it was a really good for them to experience this type of race. Click here to view more pics from the trip. Thanks to Mr. Beatty for providing this writeup!